The image is appropriated from an early American wood engraving by Alexander Anderson. 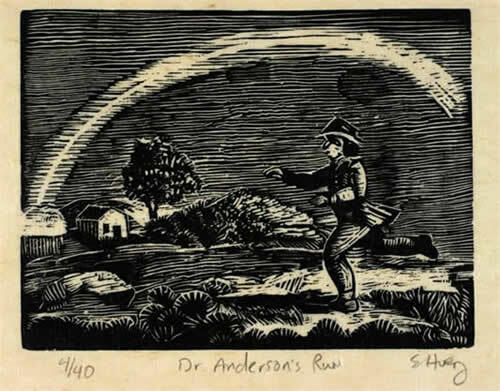 Anderson began his career as a physician, but he had always been interested in engraving and in 1798 after his family died in a Cholera epidemic, he abandoned medicine for printmaking. He was the first printmaker in the United States to record experiments with a graver on the end of a boxwood block in the Bewick while line style. He has been called the father of American wood engraving. His prints are collected in scrapbooks in NY Public Library. This Anderson image is from Vol.8, pg 34.